Luxury villa with swimming pool with whirlpool, private beach, boat dock. Built in the late fifties retains the charm of the period but with the careful restoration of last year the modernity of all current comfort including air conditioning. 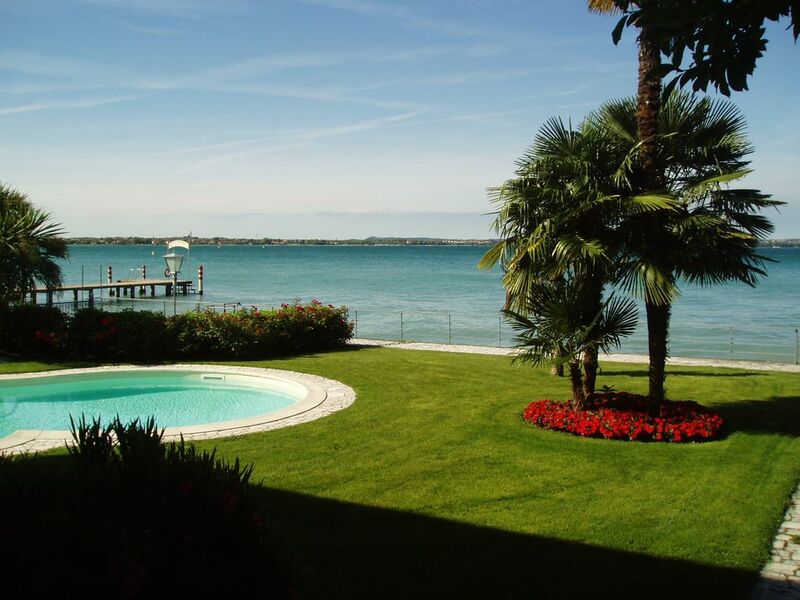 Developed over two floors upstairs three of four double bedrooms have a lake view over the Bay of Desenzano, three bathrooms one with Jacuzzi. Downstairs the living room with a spectacular terrace overlooking the garden, swimming pool, lake view, kitchen with outdoor barbecue, a single bedroom and a bathroom. In the basement the technical area and the laundry room with washing machine. The location of the house in the historic center of Sirmione makes it unique for the convenience of shops, bars and restaurants, although the extremely quiet location makes it a real pearl of relaxation and privacy. Adjacent to the spa Terme di Sirmione. Including final cleaning and linen change weekly, for further cleaning and linen contact. The villa is located within the old town of Sirmione but the internal parking so after appropriate authorization the entrance to the villa is with your vehicle. Classy place. Reminded me of Fellini's 8 1/2. I played Mastroianni's part and talked smart to my friends. Lots of room to relax and cook for four couples and our Italian friend who had a great time in the cook's quarters. (Sorry Lorenzo). Marble and steel, not a creek to be found. An engineer must have taken a hand. Some dreaded driving through the multi turisti that crowd the peninsula, not me, found them charming and mostly Italian. No rudeness if you drive at a comfortable walking pace. Thanks Simonetta. We had fun. Review really original and welcome. You have perfectly interpreted the spirit of the holiday in Sirmione and the Villa. The swimming pool with the lake 20 feet away exceeded our wildest dreams. We took the description of the property having a 'boat dock' on the lake literally and arranged to rent a small motor boat for several days. However, the reality is you CANNOT dock anything there unless it is some kind of small inflatable as there is no mooring positions alongside villa - the jetty in the photos belongs to the villa next door. The old town of Sirmione has tiny, narrow streets always thronged with people which you have to drive through to reach the villa. Motor entry is only allowed in the town if you have a permit (sent to us by email). As we were renting cars and did not have registration numbers we had a temporary permit which you have to hand into the Police kiosk on arrival at the gates of the town and have a permanent one issued. There are strict rules when you are not allowed to drive through the town and we were caught out on 2 occasions and had to hang around for a couple of hours until traffic was allowed through. It is a short stroll from the villa to the old town which is full of restaurants. We found one small shop selling milk, cheese and bread but you do need to leave the town to buy more basic goods in a supermarket. Sadly, out flight was delayed for 3 hours so we were late arriving. There was no welcome pack of basic items and no shop open. Ideally we would have shopped on our way to the villa if we had not been so delayed. and bought supplies of water, milk, bread, butter, coffee and tea and loo rolls to set us up for a few days. The air conditioning is only located in the 4 upstairs bedrooms and was vital due to the humid weather. The Wifi never worked and we communicated this to the owner who replied she had paid and it should work but it never did. However we did have 4G. We had an enjoyable holiday but despite the print out from the owner stating we must leave between 10 and 11 a.m. on the morning of departure she then informed us 2 days before we were going home that we needed to be out a 9 a.m. and the time on the print-out was an error. We were not flying home till late afternoon and had planned a leisurely breakfast and last swim but after tense negotiations she agreed as long as we were out of the bedrooms so they could be cleaned by 9 a.m. we could stay a bit longer. However, after packing up there seemed no point in hanging around whilst the villa was turned round so we left. That was disappointing end to the holiday. The villa is very comfortable and the location is perfect. Swimming between the adjacent piers means the lake feels like another private pool. Sirmione has lots of tourists, but none came to our end of the peninsula unless they were lost, so it is very quiet without a trace of noise from restaurants or bars. We didn’t hire a car as we simply wanted to stay in Sirmione. As the centre of town is full of tourists with very narrow streets, it would be a pain to drive through. There were a few minor problems with the villa. We could not turn on the oven, although the gas rings worked. Also we could not close the villa gates. I reported these but no one came to help. Also, we could not find a switch to turn on the poolside lights. The internet worked on the first two days but not the last five days. I'm sorry you had these little problems but you had my phone number and you never called me. I heard about the oven and now I'm activating for the repair. If you had called me I would explain to you how to turn on the pool light. The doors of the house are closed. I did not understand what does not close. If you instead refer to the entrance gate this did not close because the driver who brought you broke the photocell in making a maneuver. I could not know this and you should have warned me. Internet has been recharged for the month the day before your arrival. Unfortunately it is not unlimited and if you have downloaded a lot of programs and films this is exhausted. You could call me to recharge it. Despite nonexistent Wi-Fi and the stove you have to tinker with we love this place and it was our second time to rent it. We brought the family and there’s plenty of room for everyone. Be sure to get an opportunity to feed the swans. It is walking distance to everything that you could ask. it was a real pleasure to have you as guests. Amazing house. Great location and space. huge pool. Helpful host. Can walk anywhere. Comfortable beds and all the necessary amenities. Other Activities: Thermal Spa Terme di Sirmione.